So early in my new blogs existence I am using someone else’s photo. Taken last week in Brittany by my very talented brother (one of them) he has very generously donated (it was free wasn’t it?) this magical picture for your delectation. Escholtzia and cornflowers, linum, field poppies and achillea adorn this lush carpet. Undoubtedly crickets were chirruping, butterflies flitting and hoverflies, well hovering. Does a more perfect meadowscape exist? Mind you from the angle of the picture I would imagine a mysterious man sized crop circle has appeared in this field! Love the wildflowers meadows!!! they are so colourful and full of life! 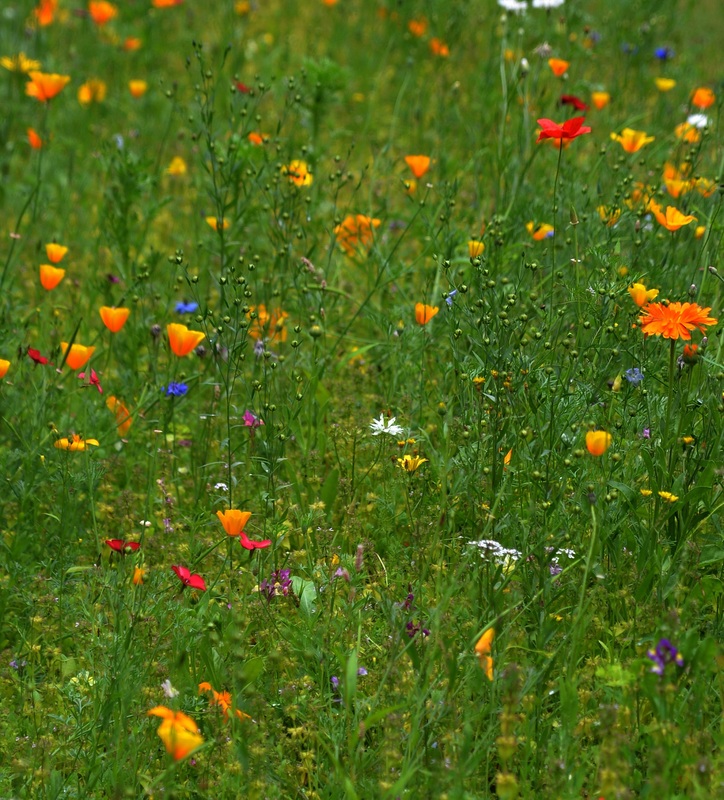 More perfect?well maybe not ,but our wild meadow is pretty fan..bbbb….tastic this year. Very pretty. Some good ideas there for copying. My brother told me after I posted the picture that it was taken in the grounds of an abandoned monastery, can it get more romantic? Aaah, the poppies! Oooh, the cornflowers to set them off! I can see why you posted this photo. I’m enjoying your new blog, and I’ve chosen to follow. I’m a professional gardener in the USA. Your brother’s photo of the wildflower meadow is extraordinary. May I use it for the desktop background photo on my computer? The photo would work very well used that way. I’m sure he would be thrilled Amory, and thank you for asking, he is a great photographer, I am a little biased though! Hopefully soon I will be posting more, it is an “in between” time at the moment. Looking forward to sharing with you.